25A Ground Bond Tester for TUV and other Production LIne Tests. Simple to use, easy to interpret: GREEN is PASS, RED is FAIL; FAIL stops test and buzzes. A complete, one-touch solution when teamed with a Compliance West Hipot Tester and our HTT-1R Function Tester. Ships complete with test cables and a NIST Calibration Certificate. Heavy metal case and rugged construction, designed for factory environments and continuous product testing. A quality product built to last, made in the USA. We calibrate and repair everything we make. Not sure - contact us! Pairing with a Compliance West Hipot Tester and our HTT-1R Function Checker makes a complete TUV Production Test Package. Logic Controlled, One-button testing. LED indicators. Buzzer upon failure, test terminates. AC output. 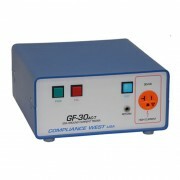 Constant current delivers 25 amps to any ground circuit with resistance of 0 to 0.1Ω. Virtual voltage sense circuit. ignores resistance of test leads for accuracy. NEMA 5-15 Receptacle for plugging in the device being tested. Universal receptacle available for testing products with International plugs; order Option 30AC-T-W.
0.1Ω calibration resistor mounted on rear panel. Designed for TUV, NEMKO and CE Safety Agency production line testing, including IEC601. 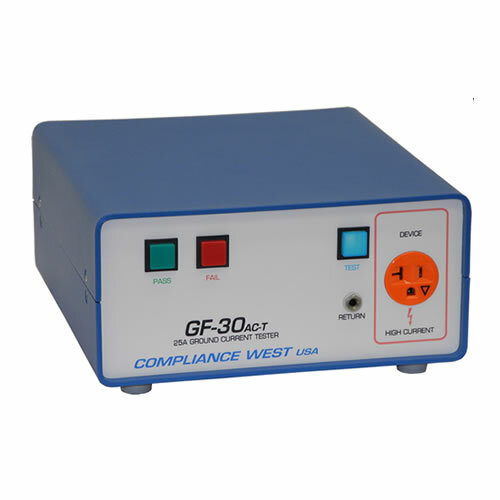 With Option TL, the GF-30ac can be teamed with any of our -P hipot testers to make a one-touch test for both Ground Bond and Hipot Tests in accordance with Nemko, TUV and other european production testing requirements. Specify Option TL with your hipot purchase. The the current setting can be set to any level between 10 and 30A when purchased. Specify Option 10-30 and note requirement in comments when ordering. 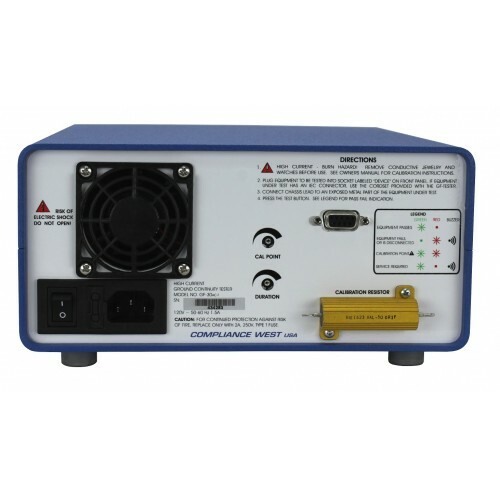 All test leads included, and a Calibration Certificate is supplied. Calibrated to NIST standards; A2LA (ISO 17025) Calibration available. Test Duration Timer 0-25 Sec Approx.